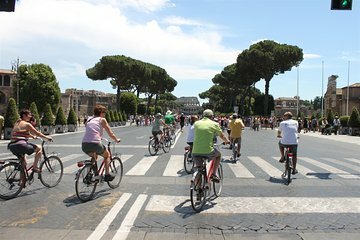 On a bike tour, you can see more of Rome’s top sights in less time, learning about them from a guide. The pleasant guide was German with a good grasp on English but not enough to lead a tour. As a family of 4 we enjoyed the activity overall but have had experiences with much better companies. Would not recommend this tour because it was not worth the money. Advertised as having an ice cream included during the tour which did not happen. Great tour! Bici and Baci made this tour simple and easy to attend. Romina was our guide and did a fabulous job showing us the beautiful sites in Rome. Highly recommend. Best way to see the city!